Thousands took part Sunday in the traditional march with Israeli flags through Jerusalem to celebrate the city’s reunification. Thousands took part Sunday in the annual Flag March in Jerusalem, which celebrates the city’s reunification in 1967 after 19 years of division. Police almost changed the route of the march this year over fear of Jewish–Arab clashes in Jerusalem’s Old City. 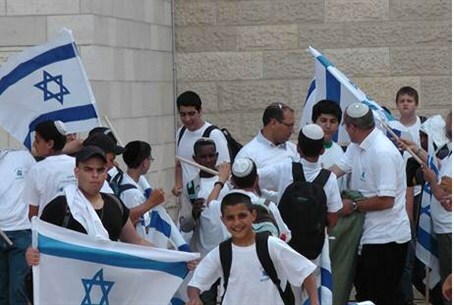 The march was authorized after Rabbi Chaim Druckman and other religious-Zionist leaders met with police commanders and promised to avoid confrontation. The traditional route takes celebrants from King George street to the Western Wall (Kotel) via the Yafo Gate and Shechem Gate of the Old City.